SushiFork in Tulsa specializes in making great sushi to satisfy the tastes of every customer who enjoys our wide-ranging selections. We are not afraid to explore textures and flavor combinations to come up with something new and interesting. By pushing the edges of the envelope, our team continues to bring you fresh new concepts that quickly become your new favorites. Departing from the norms allows us to offer our unique perspective on how we prepare our food. 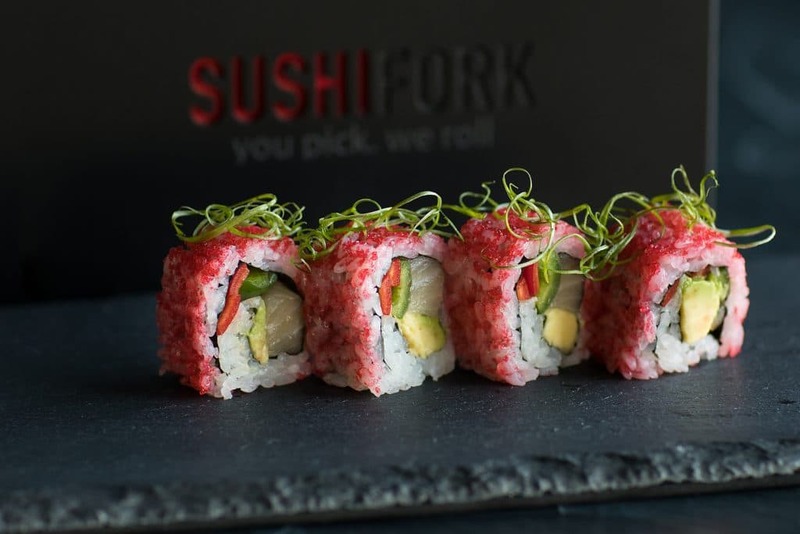 SushiFork is known for our fusion of flavor, texture and artistry in preparing and presenting every dish we offer. We are happy to serve our customers in the greater Tulsa Hills area and welcome your presence for a nice date night, to welcome or make the most of the weekend or for your next special event or occasion to celebrate in a comfortable environment where you are served and fed very well. 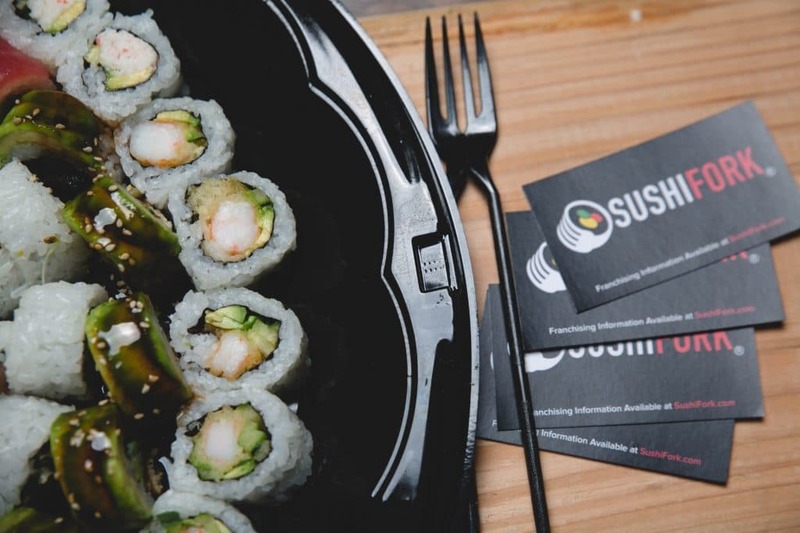 To mark your own special celebration or ceremony, SushiFork will cater your event providing the most unique menu selections of your choosing that your attendees and guests will both enjoy and remember for some time to follow. 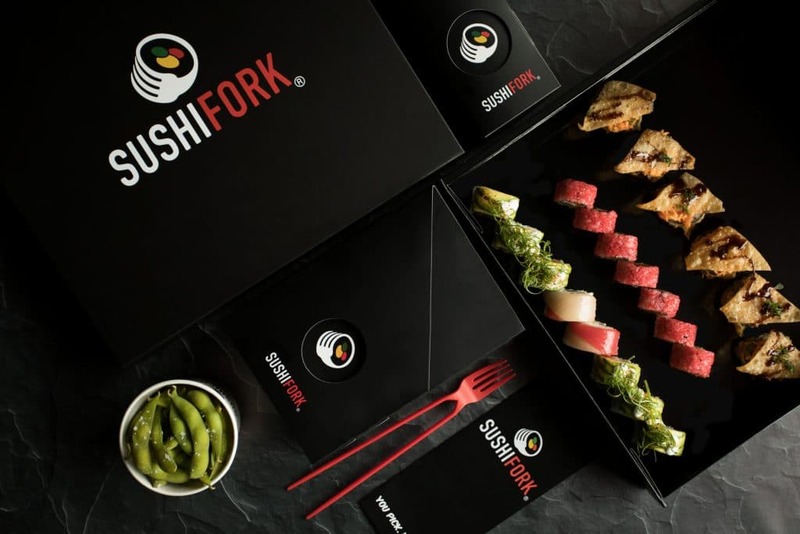 The SushiFork team brings a creative flair in preparing and cooking these selections mixing and making sauces or creating new versions of the old favorites. Between your ability to build your own roll to our many other menu creations, you are sure to find something that suits your desires and appeals to your taste preferences. We take pride in presenting a menu that is worthy of being an addition to the Tulsa Hills area food offerings. Every roll, every entrée at SushiFork is inspired by our chef and thoughtfully and creatively prepared for you. You can enjoy a wide variety of flavors and presentations in our pursuit of excellence. When you visit SushiFork in Tulsa, you are part of the family and we are eager to share the ethnic influences and cultural appeal that attracts patrons from near and far who are looking for a taste of the world in a place that is right at home in Tulsa. Our focus is on flavor as every roll is masterfully created using fresh ingredients. 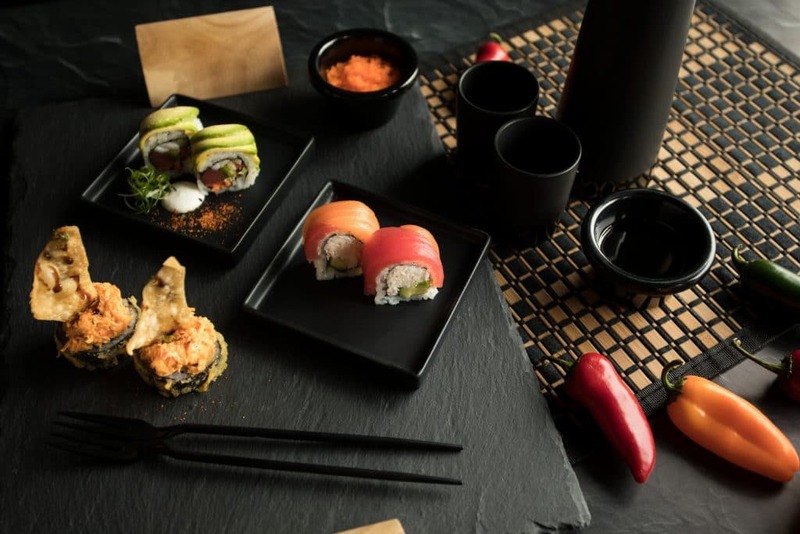 Why not start by creating your own sushi roll choosing from eight handcrafted pieces? You pick, we roll. Beginning with either a seaweed or soy wrap, you then have your choice of one of 16 proteins upon which to build your signature roll. You can add additional proteins at $2.50 each, if you desire. Among the cooked proteins from which to choose you have delicious seafood Tempura including your choice of Salmon, Yellowtail, Tuna, Krab or Shrimp. Tempura is the light batter made using cold water, sometimes even using cold sparkling water to keep the batter light. Soft flour and other ingredients are mixed in small batches using chopsticks for just a few seconds to avoid activating the gluten in the flour. This results in an unusually fluffy and crisp structure upon frying. The chef will keep this batter batch on ice preserving the cold to ensure this fries to a delicate crispy crunch. Other cooked proteins to choose from are Shrimp, Krab Mix, Chicken, Tofu, Eel or Fried Calamari. You also have a choice of raw proteins including Salmon, Smoked Salmon, Tuna, Yellowtail or Hot Mess Mix. Once you have your main ingredients, choose your fillings. In addition to the cucumber, sprouts, carrot and avocado you are probably already familiar with, you can choose from cream cheese, bell pepper, jalapeno, strawberry, lettuce or Ponzu mushroom. Are your taste buds getting tantalized? Wait, we are not done yet. Next, you get to choose your toppings including scallion, cilantro, mango, sesame seeds, Masago, Tempura Crunch, bacon, Tagarashi, Ghost Chile Spice, and just for fun, choose either Crushed Funyuns or Spicy Crushed Cheetos. For an additional charge of $2.50 each, you can top your wrap with either Krab mix, Hot Mess Mix or Avocado. How about your sauce? A Spicy Mayo may just add the right balance for your roll, or how about the Honey Truffle Aioli? This is a French sauce similar to mayo consisting of garlic, lemon juice, egg yolk and oil with the extremely rare and aromatic delicacy from the fungi family that gives an intense and earthy flavor. This is an exquisite sauce that partners beautifully with fish. You also have Sriracha, Lime Crema, Wasabi Ranch, Honey Wasabi Mayo and Sweet Soy Sauce, Teriyaki or Habanero Mango. You can round out your roll with Edamame, the stem peas prepared from immature soybeans in the pod, and Miso Soup for an additional $4.00. Our chef offers the best of the favorite sushi rolls including the Veggie Roll containing carrot, bell pepper, cucumber, sprouts and avocado, and the California Roll containing Krab Mix, cucumber and avocado. The New York Roll is made with Shrimp, avocado and cucumber, and the Tempura Shrimp Roll is a crispy delight with cucumber and avocado for both texture and a fresh and cool combination. 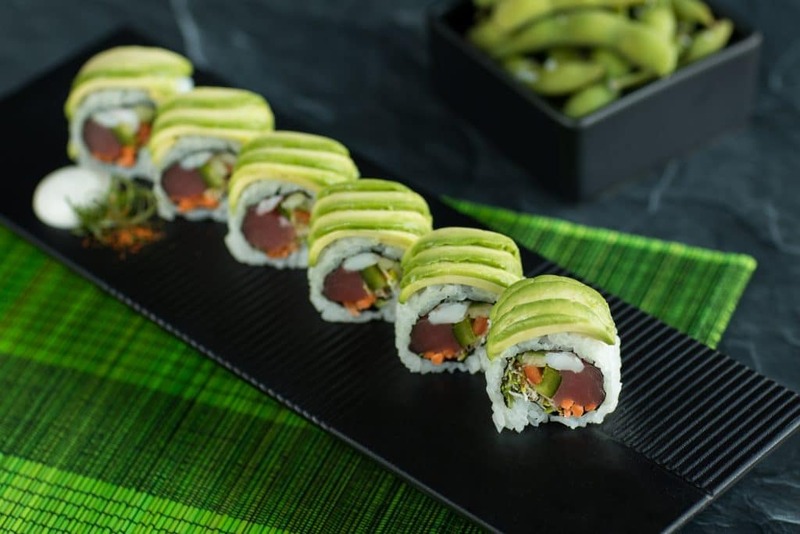 Spicy Roll is available with your choice of Tuna, Salmon or Yellowtail along with sprouts and cucumber and touched off with Spicy Mayo. The Philly Roll is a dreamy, creamy combo of Smoked Salmon, cream cheese and avocado. If you are looking for a kick, try the Thunder Roll that combines Tempura Shrimp, jalapeno and cream cheese with Spicy Mayo to seal the deal. The Candy Roll blends both Shrimp and Krab Mix with avocado and Spicy Mayo. Now, maybe you are ready for a most unique mouthfeel experience with our Kiss Kiss Bang Bang combining Krab Mix and avocado with cream cheese, Sweet Soy Sauce and the surprise ingredient, Pop Rocks! Something you have to try just for the experience. 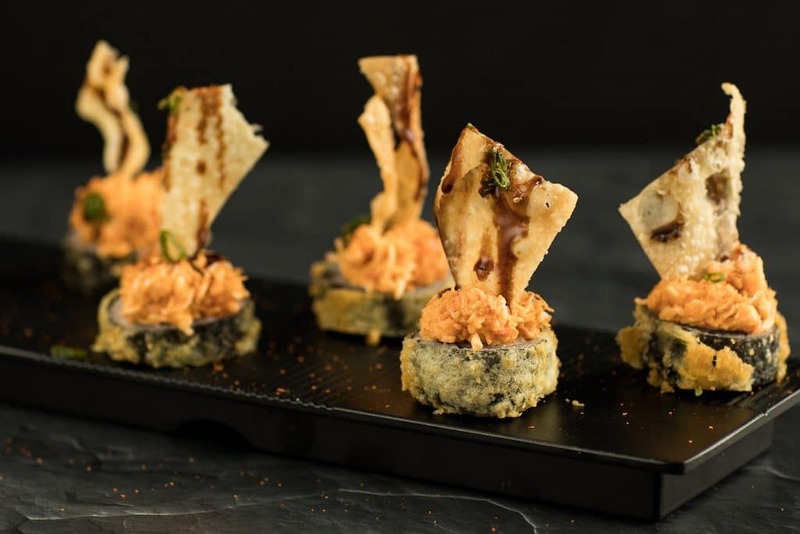 The Carnival Roll is a feast in itself with both Yellowtail, Salmon and Spicy Hot Mess Mix combined with cream cheese, jalapeno and bell peppers, Tempura Fried and topped with Spicy Mayo, Lime Crema, Sweet Soy Sauce and topped with scallion and Togarashi. For a real hot kick, we offer Fire In The Roll starting with Fried Calamari, avocado and cucumber and adding jalapeno, cream cheese and Masago, then topped with Spicy Mayo, Habanero Mango Sauce and scallion. To honor the First Responders, SushiFork of Tulsa offers the FFR Roll. This is a Tuna and Shrimp Roll that includes cucumber, carrot, jalapeno and bell peppers, sprouts and avocado topped with Lime Crema, scallion and Togarashi, and for good balance, it is served with a side of Cilantro Lime Sauce. 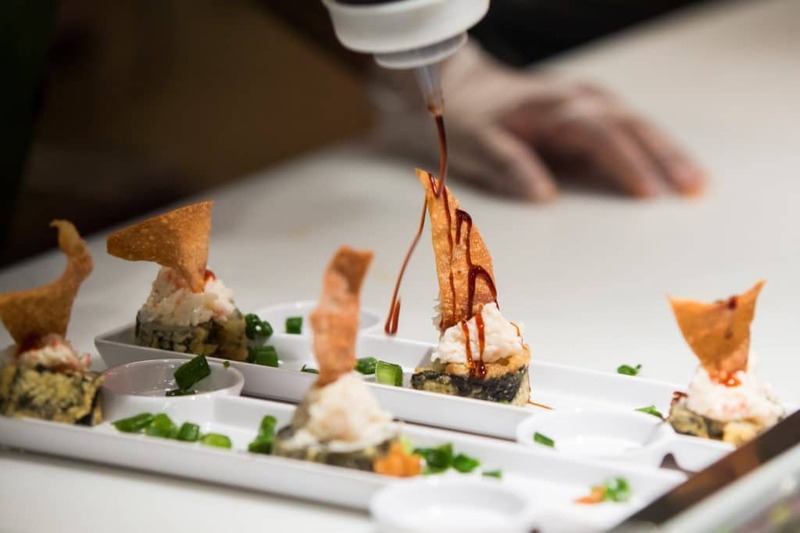 Finally, in the offering of sushi rolls is the Admiral Crunch starting with Tempura Shrimp and Krab Mix combined with cream cheese and avocado, then topped with Tempura Crunch, Tempura Krab, Masago, scallion, Noney Truffle Aioli, Sweet Soy Sauce and Togarashi. This is one roll that is certainly worth a try. In the ongoing effort to introduce something unique and delicious, SushiFork offers Sushi Burritos. Each is formulated to give you something unusual while appealing to your sensory pleasures of taste, smell and texture. The Kaptain Krunch, of course, contains Tempura Krab along with Tempura Shrimp. Cream cheese and avocado keeps this roll cool and it is served alongside the Honey Truffle Aioli dipping sauce. Prepare to be delighted with this one. Next, try our Three Amigos including triple fish offerings of Tuna, Yellowtail and Salmon. Bacon highlights this trio along with avocado, lettuce, jalapeno and both Spicy Mayo and Sriracha. For something a little lighter, try the Pokemon Sushi Burrrito that has Tuna, cucumber, lettuce, jalapeno, sesame seeds, Togarashi, Sesame Oil and Ponzu. At the same time, we strive to deliver something that appeals to all members of the family. We offer some of the kids’ favorites such as Chicken Bites and Fries, Corn Dog and Fries, Chicken and Waffle Bites and Teriyaki Chicken and Rice. Round out your kids’ meals with some of our fun desserts including Strawberry and Nutella Wrap, our Sweet Street Cookie, which is GMO and additive-free, the Salted Caramel Crunch or the Chocolate Chunk. SushiFork of Tulsa Hills makes sure our guests enjoy the full complement of menu items, and this is no less significant than in our salads, sides and wraps. Our SushiFork Salad is highlighted with Wonton Crisps and accented by a tasty Sesame Ginger Vinaigrette and can be ordered with or without Chicken. Our Wrap has the same ingredients of lettuce, almonds, carrot, bell pepper and the Wonton Crisps and Sesame Ginger Vinaigrette. This dressing has a real lip-smacking appeal. Of course, what would an Asian meal be without a side of rice? We also offer Miso Soup, an enzyme-rich soup created from the fermented mixture of soybeans, sea salt and rice koji. This soup is such an effective detoxifying dish for how it can eliminate toxic elements from your body, strengthen your immune system and provide the extremely beneficial vitamin B12. Miso soup also contains seaweed, mushrooms, tofu and green onions. It is quite delicious and very good for your health. Other salads include Cucumber, Seaweed and Spicy Ika Salads. Ika sansai literally identifies mountain vegetables with the inference of the wild foods of the hills that would be picked at the seasonal resurgence of spring. Our Ika Salad includes the bamboo, fern and yuki shoots typical of the season along with sesame seeds, cucumber salad, scallion and Ponzu. For more fusion, try our Wicked Tuna Nachos made with fried Wonton Crisps, Tuna, Mango, jalapeno, Sweet Soy Sauce, Lime Crema, cilantro, Togarashi and scallion. For more fun and engaging fare, try our Kimchi Fries, which are thick cut fries topped with a layer of caramelized Kimchi and Bacon. We add sugar to the Kimchi along with gochujang, soy sauce, and vinegar and caramelize the mixture in a saute pan. If you have never tried these fries, you really must indulge in this flavor excursion. What Would A Sushi Bar Be without Sake? Our beverage selections fulfill the desires of all our guests, to be sure. We have beer, wine and sake for the adults. We offer hot or cold sake, and in keeping with tradition, it is customary when indulging in sake that you pour for your guest first and safe service for yourself last. We also offer a wide array of non-alcoholic options including Ginger Beer, Coconut Water, Hot Green Tea, Red Bull, Bottled Water, Bottled Coke and a complement of Fountain Sodas. There are times when you have guests gathering and want to provide them with something special to eat. More and more, people are turning to their favorite restaurant for more than just take out. 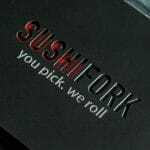 SushiFork of Tulsa Hills is no different in this appeal for parties, graduations, celebrations or events that call for something super special that is sure to please everyone. SushiFork is happy to provide for your catering needs. All of our sushi freshly made and skillfully prepared for delivery to your party or occasion in Tulsa. Whatever your craving from our wide array of choices, all you need to do is make your selections and leave the rest to us. Sushi is a big hit among guests and a welcome surprise on the menu at your events. 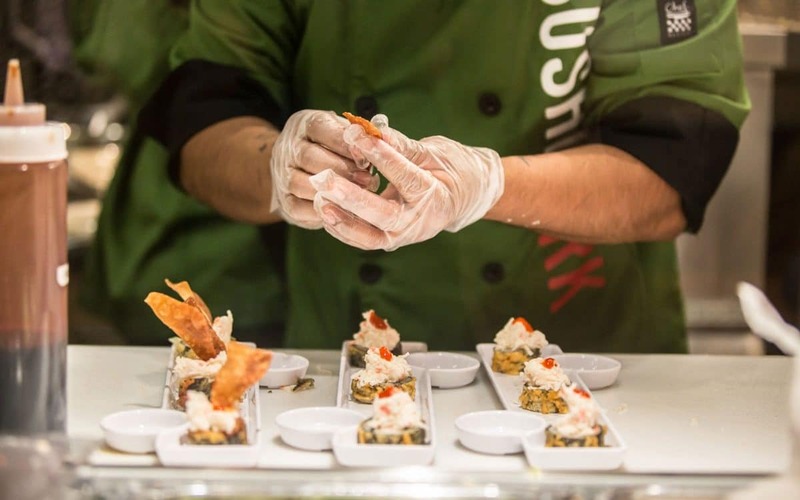 For an affordable choice that is not only fun, but highly customizable for all your guests and attendees, consider sushi for a delicious and freshly-prepared option for your next event. SushiFork of Tulsa on YELP!